Hello in Vietnamese is “Xin Chao” or for us ” Sin Chiao”. This language is very complex as it has 5 different tones. They don’t have only the é and è as in French, but other sounds coming right from the throat. To be honest, they all kind of sound the same! We decided not to take a Vietnamese class as it would take us too long to learn it and went on discovering the beautiful city of Hanoi. Hanoi, capital of Vietnam, is famous to be one of the most beautiful large cities in the country. 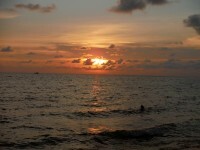 We have just started to discover Vietnam but we can say that we have been well welcomed by the local people. The city has cute little streets full of shops and small restaurants. Some “bars” are literally on the street, that basically consists of 3 low plastics chairs, 2 for us to sit and 1 for the drinks. It sounds very simple but it is a very friendly way to talk to locals and get the pulse of the city. Our accommodation was around Hoan Kiem Lake, close to the Old Quarter, heart and soul of Hanoi. Don’t be afraid to cross the streets full of motorbikes as it is said to have around 3 million registered motorbikes. Go visit the district, home for commerce for almost 1000 years, in a architectural masterpiece evolving in harmony with the history of the city. 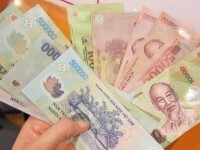 Vietnam is also known for having outstanding food at low prices. We could not wait to try it and can say we have not been disappointed. Indeed Vietnamese food is very diversified, they basically eat everything in a very healthy way. They don’t have much gluten and lactose in their dishes. it’s mainly based on soup, rice noodles and rice paper spring rolls. We now know why people here are so slim ! Not only having the chance to eating healthy, the food is deliciously good ! We highly recommend you to try the vegetarian spring rolls, vegetarian noodles or soups “pho” with fried tofu and veggies. It is the best tasty food we have had so far. They kind of eat the same for breakfast. We are still sticking on our toasts though, as it is pretty hard to switch to noodles at 8:30 in the morning. We are working on it..
– the Ho Chi Minh mausoleum with its one pillar pagoda and the heros memorial. These 3 spots are next to each other surrounded by a nice parks with trees and flowers. – along the way on the North west part of the city, we passed by other temples and small cafés and restaurants where the crowd is not as present as in the city center. – for shopping, we could see all kinds of artcrafts and local items in the Dong Xuan market. Otherwise in the Old Quarter (all around Dinh Liet street) local shops and boutiques with H&M, Zara and other famous brands can be found at 50% off. Lots of clothes are produced in Vietnam and many remain in the country (for not having passed the quality control test, we guess) to be then resold at a very competitive prices. We still cannot shop much but Hanoi can be a very good spot for shoppers. (Mainly for women). After all this excitement in Hanoi, we decided to head to the country side and discover the region of Mai Chau (pronouns Maille Chiao). In a idyllic valley, Mai Chau is surrounded by lush paddy rice fields. We booked a 2 days tour to visit the area. It is one of the best solution to go to a remote place and get interesting information on the valley, local traditions and history. We booked it with Mai Chau Nature Place which was the best choice. Our friendly guide Chi showed us our traditional homestay before going on a bicycle tour in the afternoon. We went through beautiful rice fields and peaceful villages. People here work with buffalos along with local practices to cultivate rice. Their way of living seems to be in coherence with nature and the seasons. They don’t use chemicals or anything not natural to work in the fields. Everything is made by hand or with the help of buffalos. The collect of rice is made in October. We won’t be here but it must be for sure a lot of work. Rice is present all over the world. However, we didn’t realize that rice is a long process that need actually lots of patience and time. After a deep night sleep, we took a 3 hours trekking in the mountains with another friendly guide. We could see and discover some villages along the way. They live with the basis and don’t have much. However, they seem happy and kids didn’t miss a chance to say “hello”. Mai Chau has been a fantastic experience to get to know the real Vietnam. People don’t speak much English but their smiles are very communicative. We made our way home to Hanoi with good memories and cannot wait to discover more about this country. We are now heading to Cat Ba island which is closed to Halong Bay. Tam biet, see you soon ! Book your transfer from the airport via the hotel if possible – 1 hour ride. Standard price is at 15$. A shuttle bus exists, we have not experienced it though. For budget travelers, the central backpackers in Hoan Kiem Lake has been for us a great choice: clean, friendly staff and free breakfast . Double room with TV, AC 22$, dorms 5$. 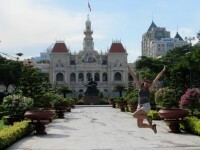 If you need to get a tourist visa for Thailand, it is easy as pie to do it in Hanoi. Fill in the form at the Thai embassy (located central) give 1 picture, proof that you will leave the country and pay 40$. The visa is ready the day after pm. To go from Hanoi to Cat Ba island: get to the bus station Lûong Yan to buy a combined ticket with bus and ferry via Hai Phong. (Hoang Long Company) for 240’000 Dôngs. The last departure is at 13:30. No need to book in advance. You can get to the bus station with a taxi that have meters. No need to bargain. If you wish to have a typical lunch or breakfast, go to a local restaurant and avoid coffee shops. The prices usually double and the food is not better.